Victas table tennis sponsorship for Australia - 3 players selected for 2018! Isaiah Lee started playing table tennis in 2012 at aged 7. Isaiah has been a South Australian Junior representative for 5 years and was selected to join the Australian National Junior Squad this year. Isaiah has been an active participant in TTSA Winter Pennant competition for the past 7 years and has been overseas to Singapore and China for regular training stints. 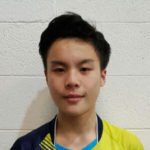 Isaiah’s long term goals are to continue focusing on improving his table tennis skills and contribute towards increasing the profile and standard of table tennis here in Australia. Alex Yeung has been a registered junior player at Table Tennis NSW since 2014. Alex has exhibited true passion and commitment to table tennis through his dedicated training with Table Tennis NSW coach Tony Lee. Alex was ranked No. 4 in Under 15 boys in Australia (Dec 2017) and No.5 in Under 18 Boys (March 2018). Alex plays all the major tournaments in Australia, and his long-term goal in table tennis is to represent Australia at the Commonwealth Games as well as the 2024 Olympic Games. Minhyung Jee has been playing table tennis for 23 years, and is currently one of the top female players in Australia. Minhyung Jee is very passionate about table tennis, and travels to participate in the major tournaments in Australia and also overseas. She is the 2018 title holder of the Australian National Championship women’s singles, as well as several other Australian titles! We sincerely appreciate all the players that applied for this sponsorship, and we’re very sorry we could not select more people, only 3 positions were available this time. We received many applications, a lot of very high standard, who are certainly worthy of sponsorship, but we were unable to offer it this time. We are confident this sponsorship arrangement will be successful in Australia, which will hopefully lead to further sponsorship opportunities. All applicants have been notified via Email already (if you did not receive it check your junk mail). Who are OOAK Table Tennis Shop? OOAK (One Of A Kind) Table Tennis Shop has grown to be one of the largest online table tennis shops in Australia, and has been operating since the early 2000s. The shop has grown to be distributor of virtually all the major brands, including top Japanese brands like Butterfly, Victas, TSP, Yasaka, Darker, leading European brands like Donic, Tibhar, Joola, Avalox and Stiga, but also some highly specialised brands like Dr Neubauer, Re-Impact and Spinlord. We also carry the popular Chinese brands like DHS, 729 Friendship, YinHe, and we’re distributors for brands like Xiom and Newgy. We don’t just sell equipment, but we’re also players ourselves, we review equipment and write many reviews and technical articles, as can be seen on this (or our other) websites. We’re also the founders of the famous OOAK table tennis forum, an international table tennis forum, that’s grown to be one of the largest English-speaking table tennis forums in the world, and particularly well known for it’s expertise in pimple/antispin rubbers and related equipment. Victas, founded by Japanese table tennis legend Koji Matsushita was an absolute legend in his time, enthusing his fans all over the world with his striving for the perfect game. The Japanese premium brand Victas table tennis has evolved from the famous brand TSP, and inspired by Koji‘s passion for perfection. ← Where is table tennis most popular in Australia?